1. Vinaigrette: Mix all the ingredients together. 2. Greens: Place broccoli and baby marrows in a dish and cover with boiling water. Allow to stand for a few minutes until just tender. Drain and rinse with cold water. 3. 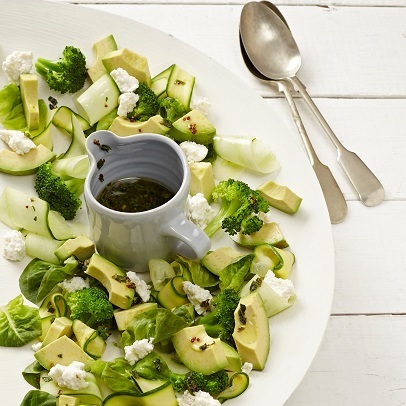 Place veggies on a salad platter with cucumber ribbons, lettuce and avocado and add cheese. Serve with the vinaigrette and a grind of black pepper. 1. Cut veggies like cucumber and baby marrows into thin ribbons with a sharp vegetable peeler. 2. This salad dressing is delicious on any salad. Or use it as a marinade for chicken or fish. 3. Goat’s cheese will also be delicious.